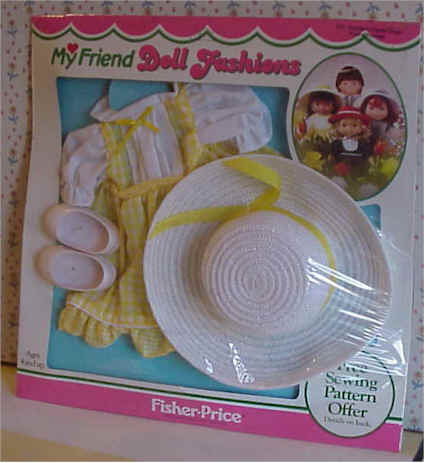 My Friend Doll outfits in original packages (MIP) and out of package. 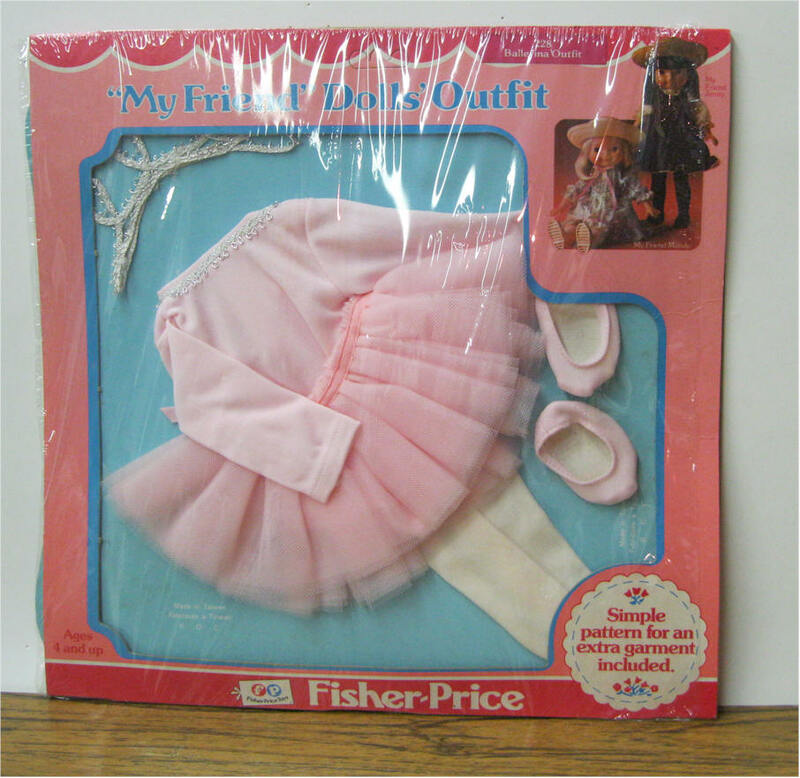 Jogging, Roller Skating, Knickers, Jumper and Blouse, Winter Wear, Springtime Tennis, Bedtime, Ballerina, Party Time Dress outfits. 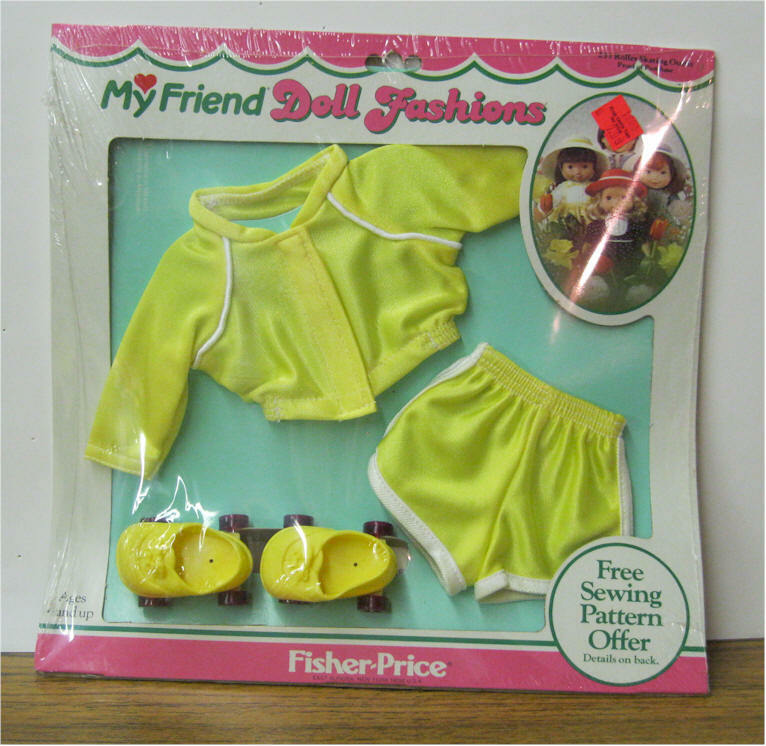 DESCRIPTION - PLEASE NOTE: Some of the cellophane on the MIP OUTFITS might be torn due to age and storage. 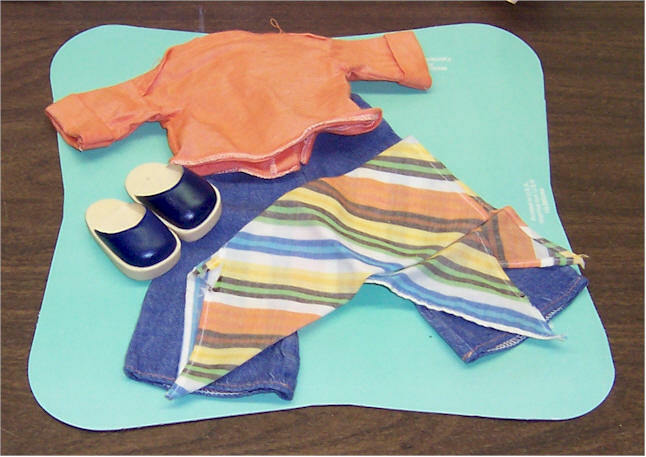 Jogging Outfit with pattern. #224 1979 - 1982. Warm-up pants and jacket. Package opened on 1 side. Roller Skating Outfit (#231). Yellow skating outfit with shoes, and roller skates with working wheels. Cellophane coming off. 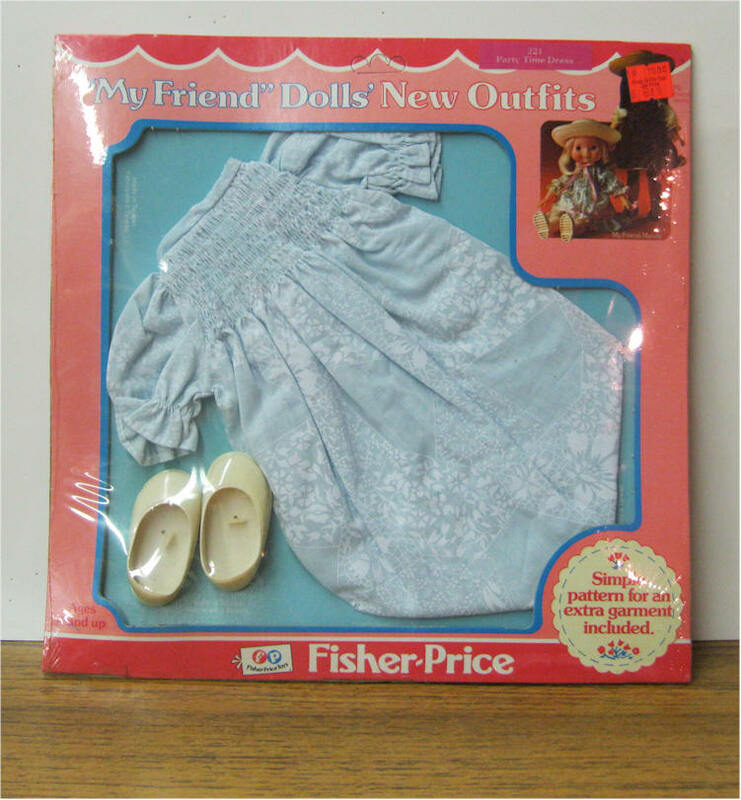 Footwear and Tights #226 1979 Comes with Sneakers, fashion boots, and two pairs of tights, white and navy blue. Jumper and Blouse #223. Blue Jumper with blouse and tie. MIP. 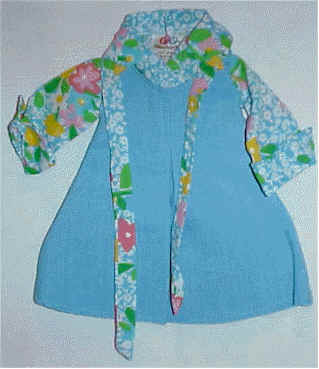 Comes with simple pattern for an extra garment. 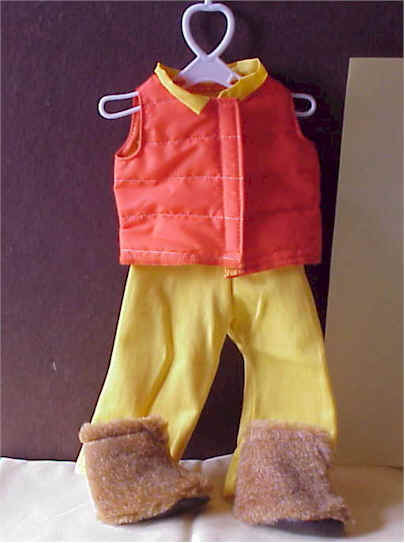 Winter Wear outfit (#230) Ski vest, slacks, and fur boots. MIP. 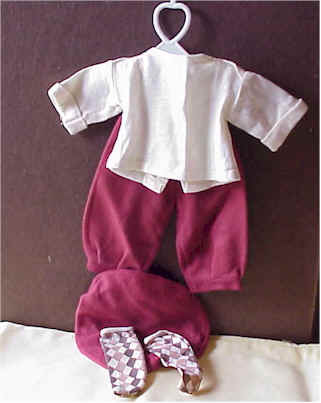 Comes with simple pattern for an extra garment. 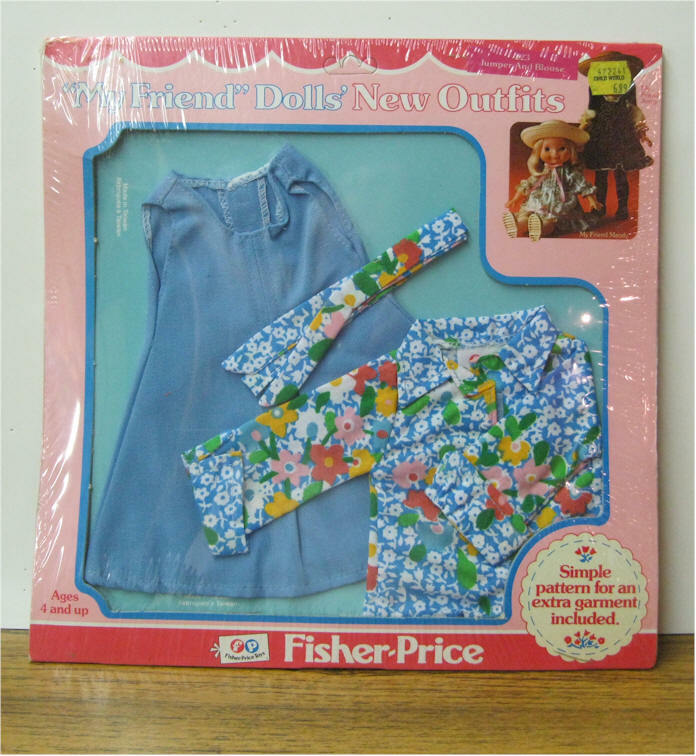 Bedtime Outfit (#232). 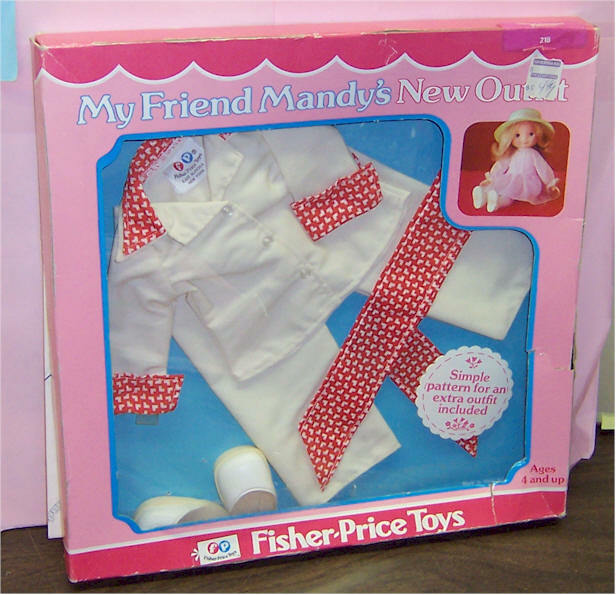 Pink flowered nightgown, rose-colored robe, and plush slippers. MINT IN PACKAGE. 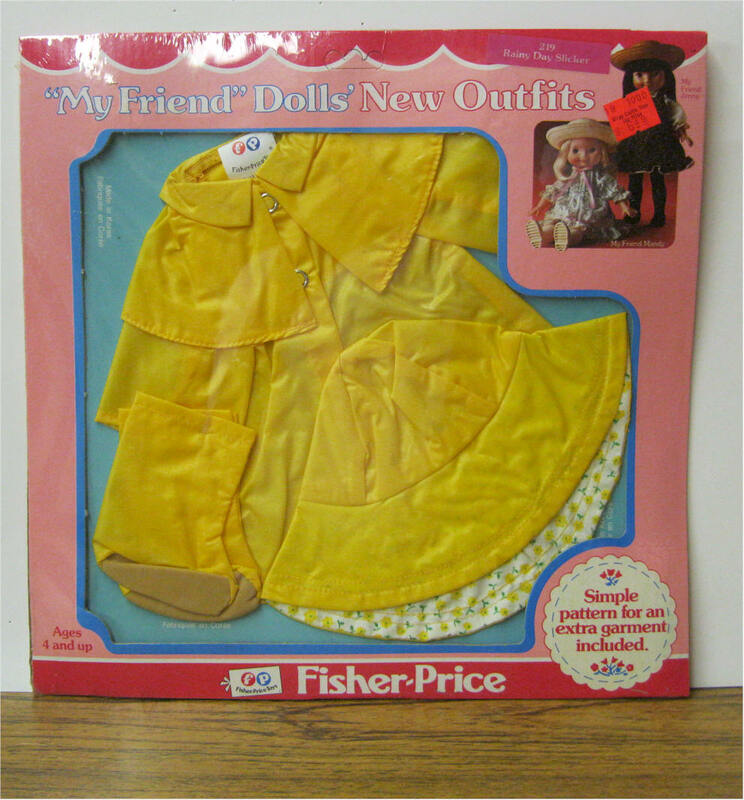 Rain Slicker Outfit (219). 1978 - 1980. 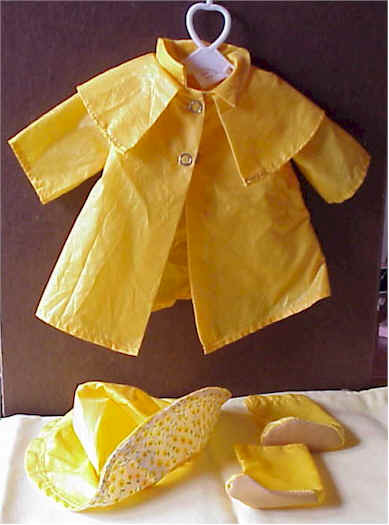 Yellow slicker with matching hat and boots. MINT IN BOX. Patio Party Denim Outfit #215. 1977 - 1978. Dark Denim skirt with pretty contracting ruffles and print blouse w red clogs. Very Rare. Comes w Pattern. Country Fair Bib-Jeans Outfit #217. 1977 - 1978. Denim bib-jeans with snap button decoration and handy pocket. Short sleeved knit shirt with Velcro fasteners. Very Rare. Town & Country Pantsuit Outfit - #218. 1977-1978. 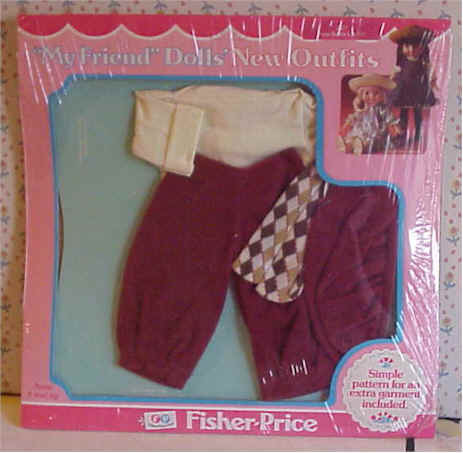 Pants with elastic waistband, three fasteners on matching skirt jacket, ascot for scarf or belt, and fashionable clogs. Very rare. Comes w Pattern. 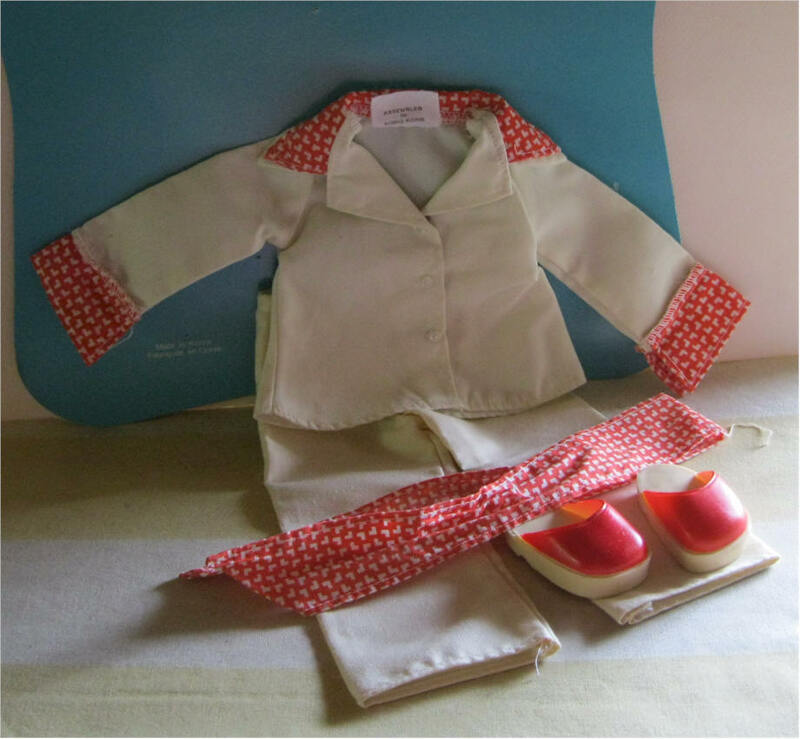 Let's Go Camping Outfit and Pattern - #222. 1978-1979. Plaid shirt. Cotton twill pants, tennis shoes and back pack. MINT IN BOX. Very Rare. Comes w Pattern. My Friend Jenny Outfit. Yellow Dress, white straw hat with yellow ribbon, and white shoes. MINT IN PACKAGE.. Cellophane coming off. 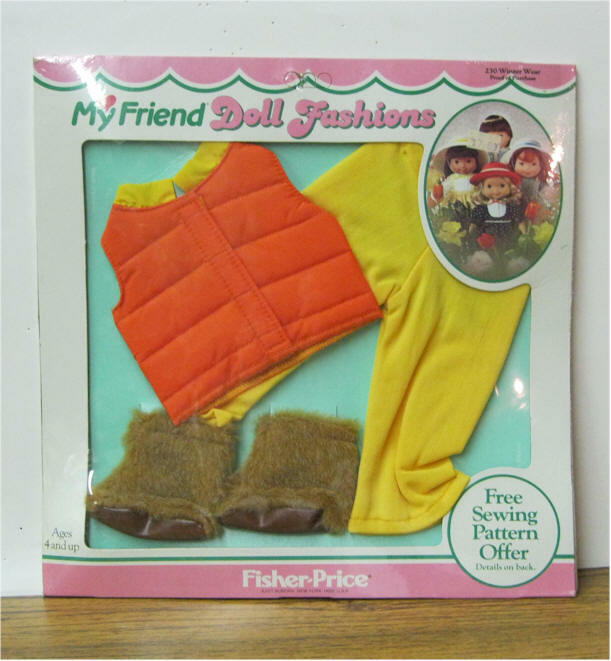 Sleigh Ride Ensemble Outfit #216. 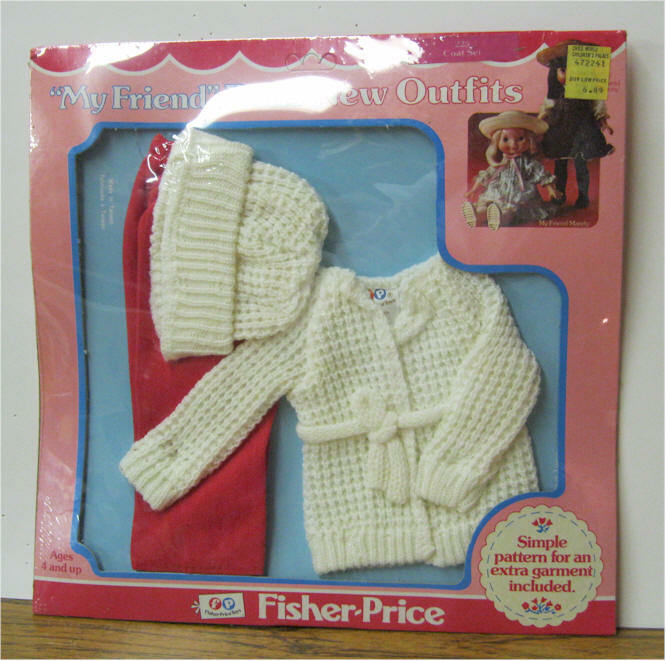 Hat and coat with plush trim uses hook and eye fasteners. 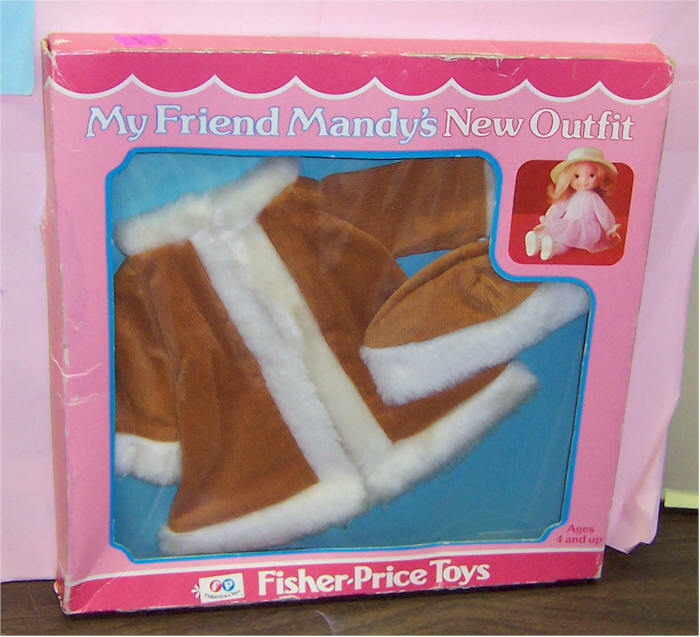 My Friend Mandy Outfit. Valentine Party Dress Outfit. 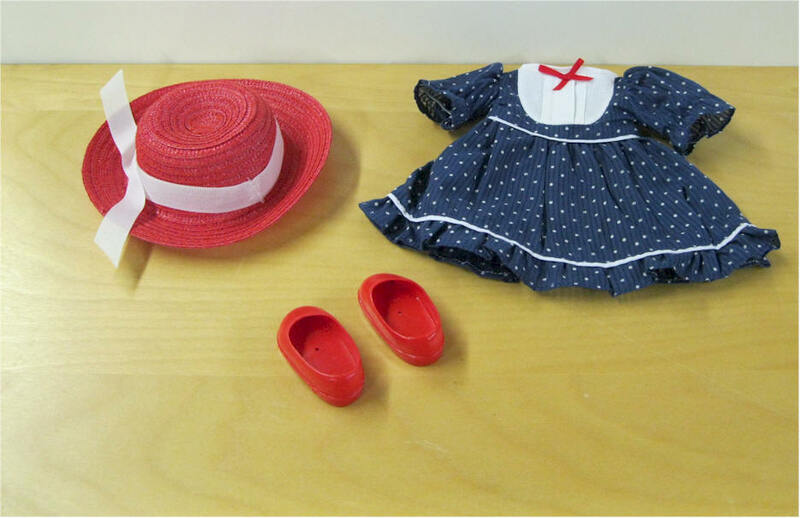 Navy blue polka-dot bib dress, red straw hat and red shoes. MINT IN PACKAGE. 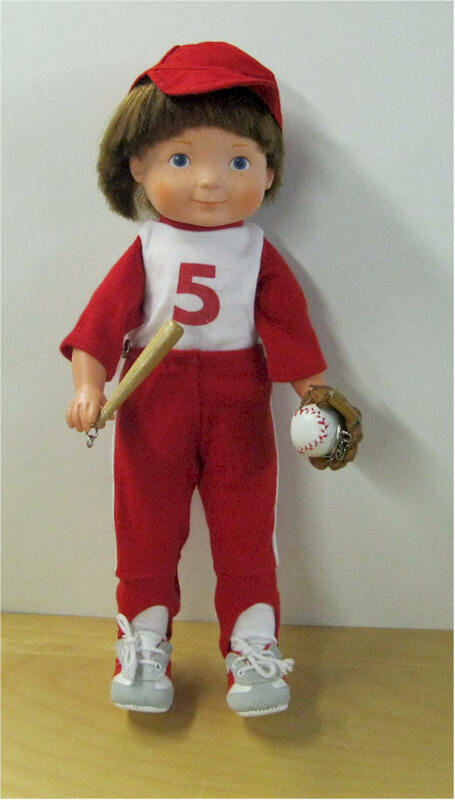 Baseball Outfit and Pattern Offer - #233. 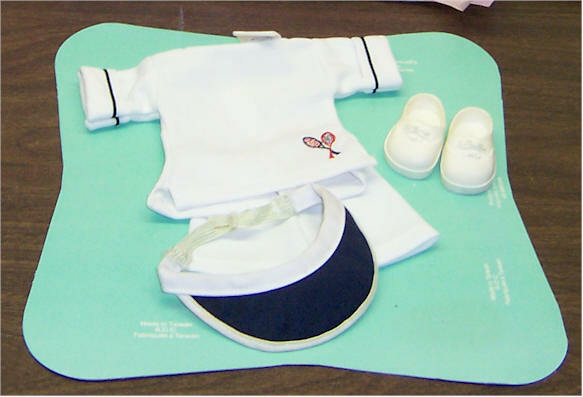 1982 - 1984, Red and white skirt, pants, socks, baseball glove, and cap. MINT IN PACKAGE. 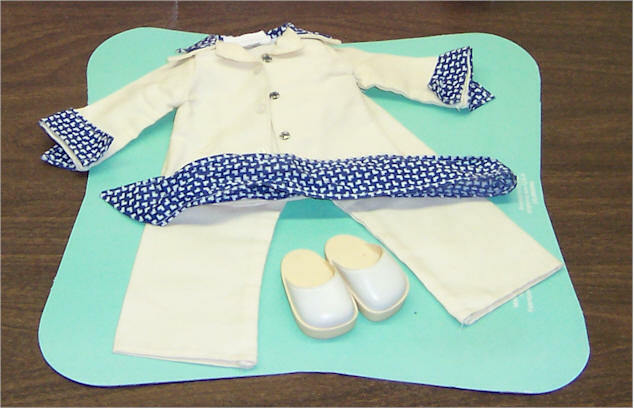 Party Time Dress Outfit and pattern, 1978-1979. Full-length gown with shirred bodice, puffed sleeves, white party shoes. Mint in package. Cellophane is off. Sweater-Coat Outfit. #225 1979-1984. Sweater coat matching hat, belt, and slacks. Comes w Pattern. 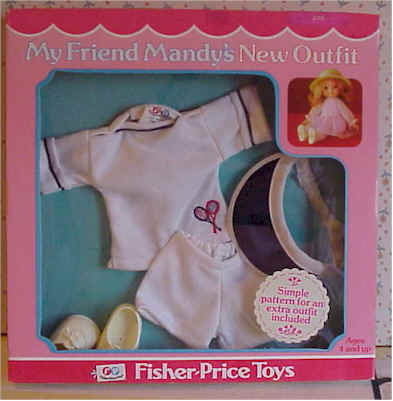 My Friend Mandy's Valentine Party Dress Outfit. 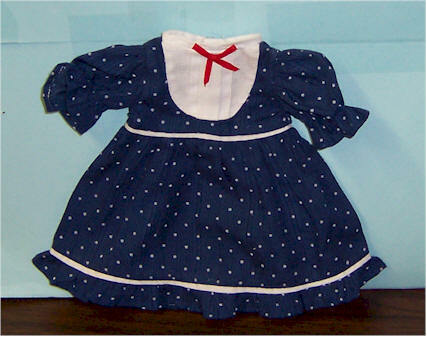 Navy blue polka-dot bib dress, red straw hat and red shoes. 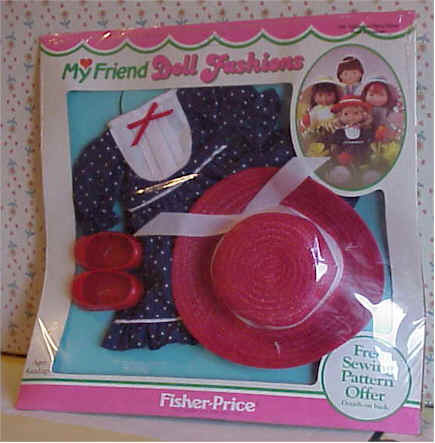 Includes hat, dress and red shoes. 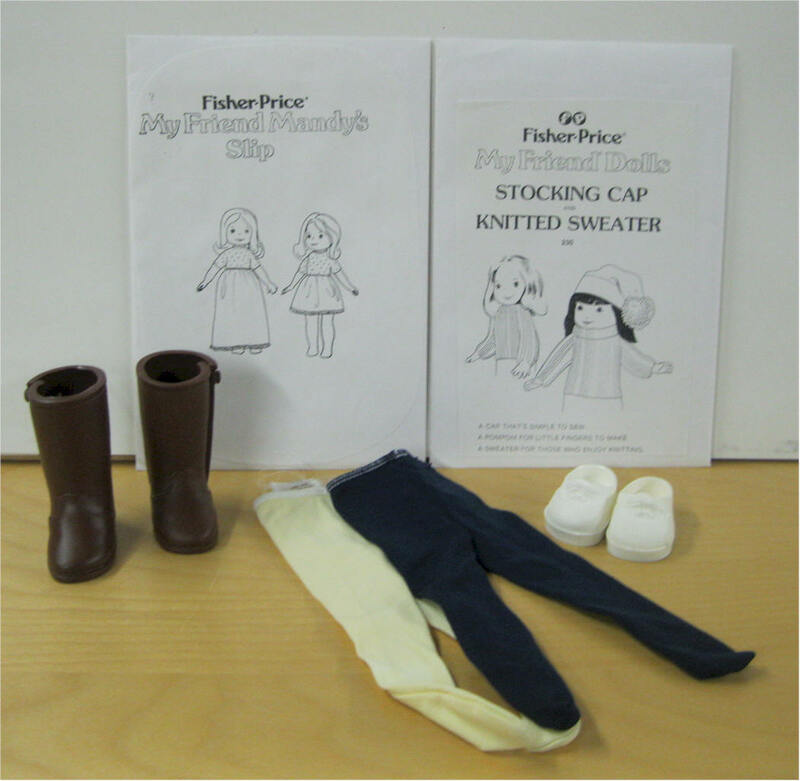 Footwear and Tights #226 1979 Comes with a copy of a original pattern, sneakers, fashion boots, and two pairs of tights, white and navy blue. #222 Let's Go Camping Outfit. 1978 - 1979. 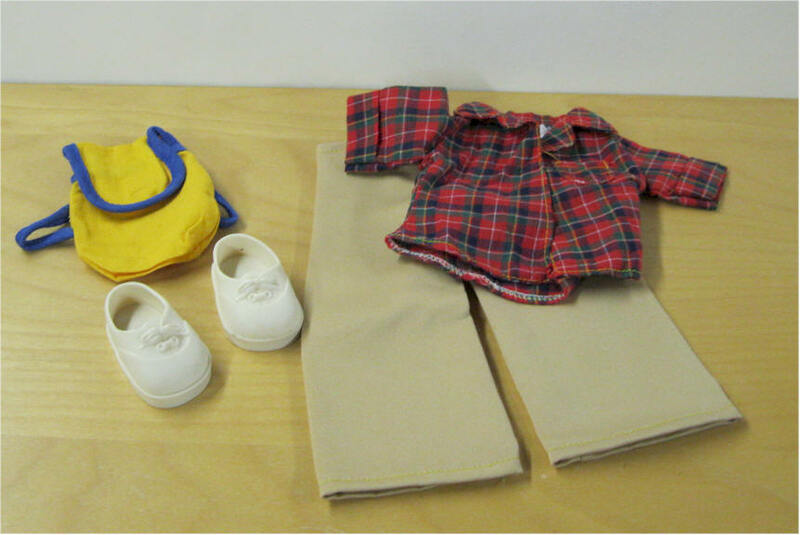 Red plaid blouse, khaki pants, boots, and gold backpack with blue trim. Good condition. #220 Spring Time Tennis Outfit. 1978 - 1982. Shirt, shorts, tennis shoes. and visor. Good condition. #219 Rainy Day Slicker Outfit. 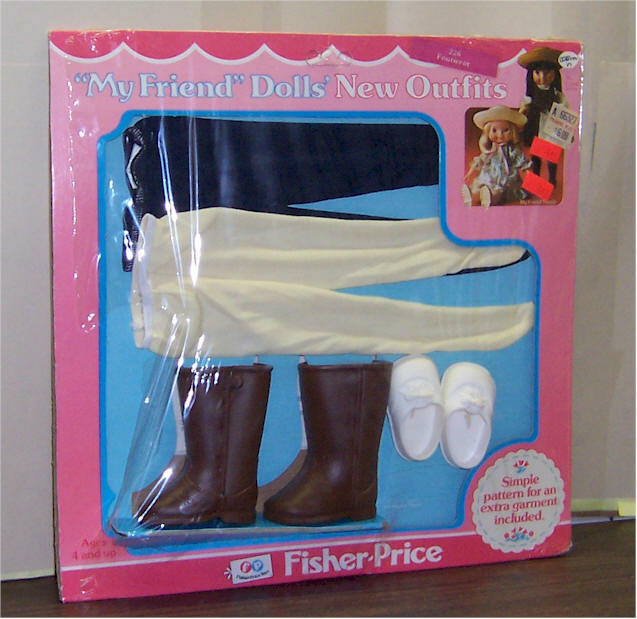 1978- 1980 Slicker with matching hat and boots. Outfit complete and in good condition. 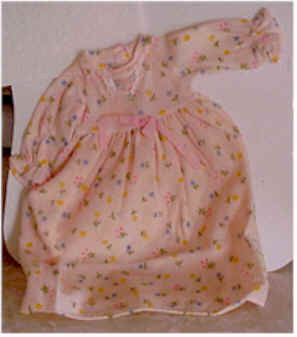 Pink Flowered Nightgown. 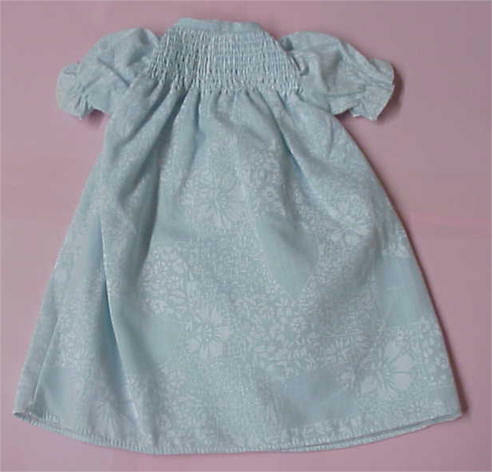 Nightgown with flowered pattern. #232 Bedtime Outfit. 1982 - 1983. 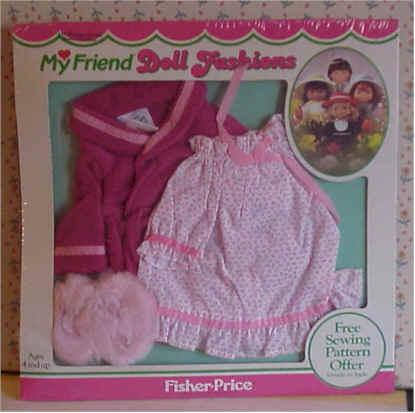 Pink flowered nightgown, rose-colored robe, and plush slippers. Comes attached to the original insert. Mint condition. #231 Roller Skating Outfit. 1982 - 1985. 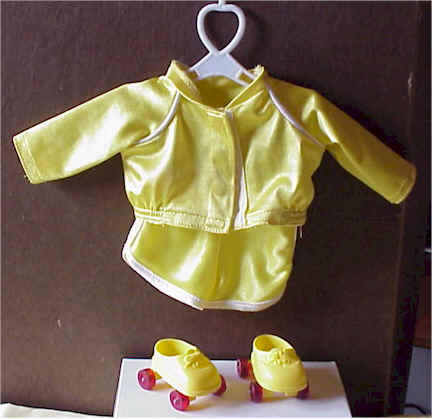 Yellow skating outfit with shoes, and roller skates with working wheels. Outfit complete. #223 Jumper and Blouse Outfit. 1979- 1982. 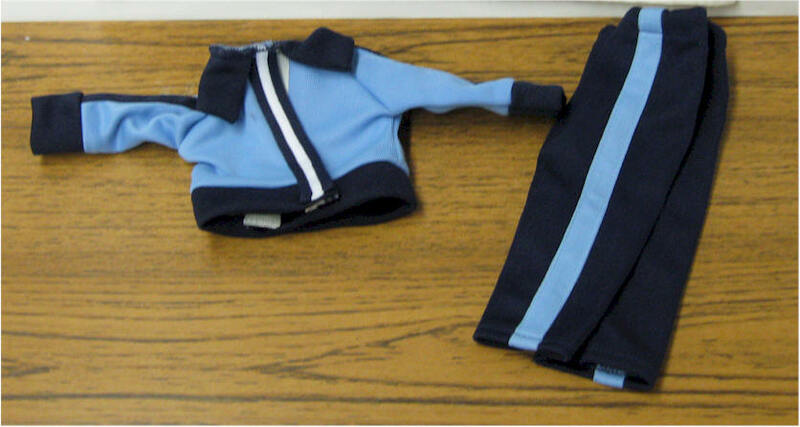 Blue jumper with blouse and tie. Outfit is complete. #224 Jogging Outfit. 1979 - 1982. 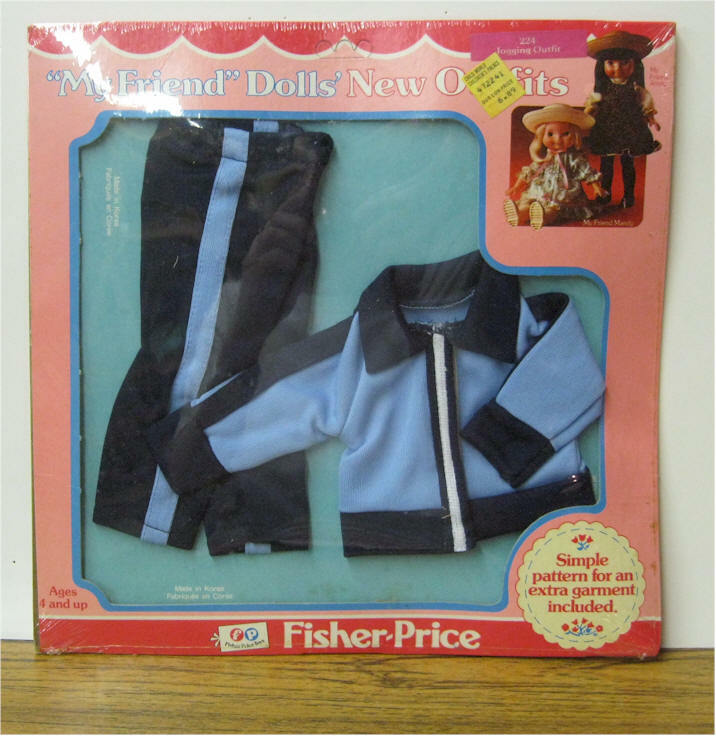 Warm-up pants and jacket included. 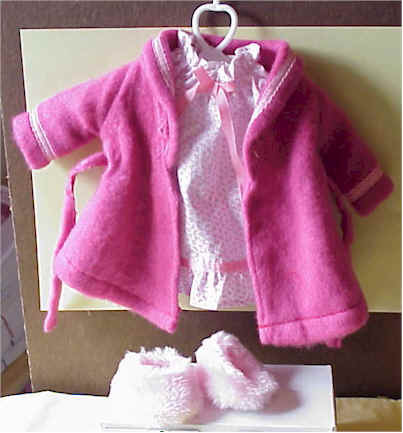 #225 Sweater-Coat Outfit. 1979 - 1984. Sweater coat, matching hat, blouse and slacks. #230 Winter Wear Outfit. 1981 - 1984. Ski, vest, slacks, and fur boots. Outfit is complete. 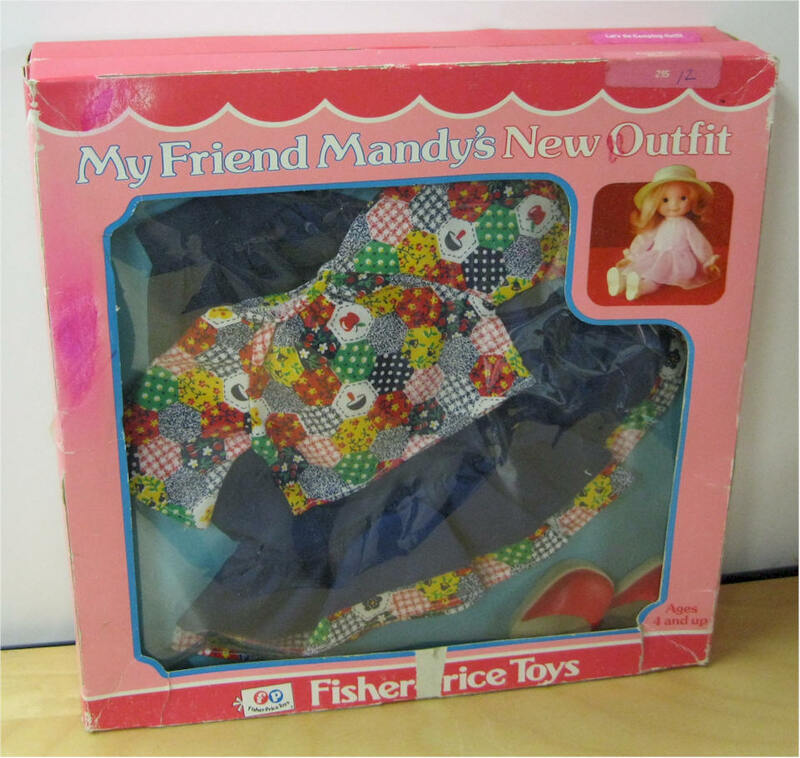 #221 Party Time Dress Outfit. 1978-1979. 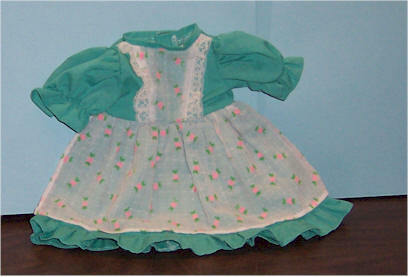 Full-length gown with shirred bodice, puffed sleeves. Clean. #215 Patio Party Denim Outfit. 1977 -1978. 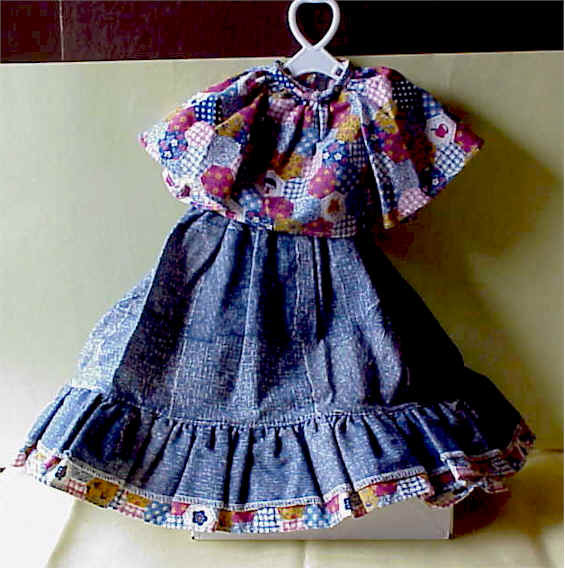 Denim skirt with pretty contrasting ruffles and print blouse. Good condition. RARE DARKER DENIM #215 Patio Party Denim Outfit. 1977 -1978. 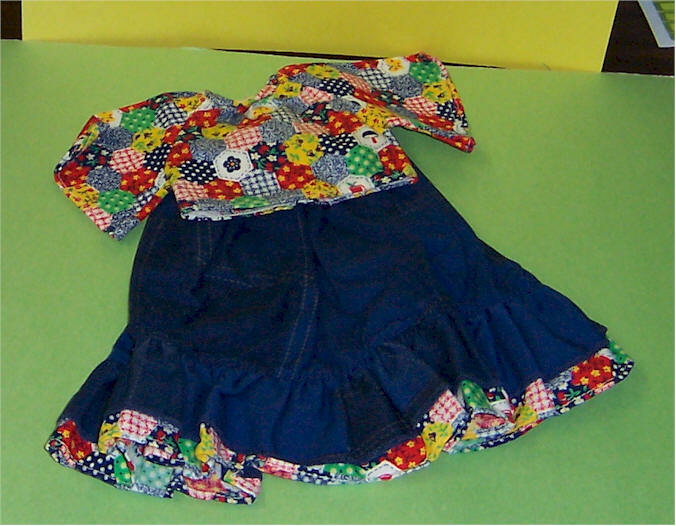 Denim skirt with pretty contrasting ruffles and print blouse w red clogs. Good condition. #216 Sleight Ride Ensemble Outfit. 1977-1978. 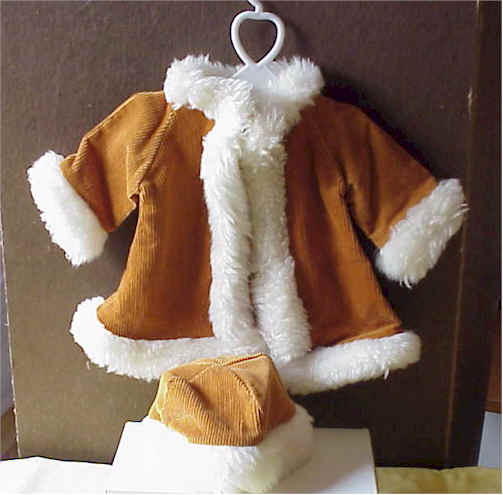 Hat and coat with plush trim uses hook and eye fasteners. #217 Country Fair Bib-Jeans Outfit. 1977 - 1978. Denim bib-jeans with snap button decoration and handy pocket. Short sleeved knit shirt with velcro fasteners. #218 Town & Country Pantsuit Outfit. 1977 - 1978. 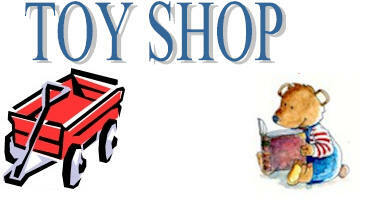 Pants with elastic waistband, three fasteners on matching shirt jacket, ascot for scarf or belt and fashionable clogs. 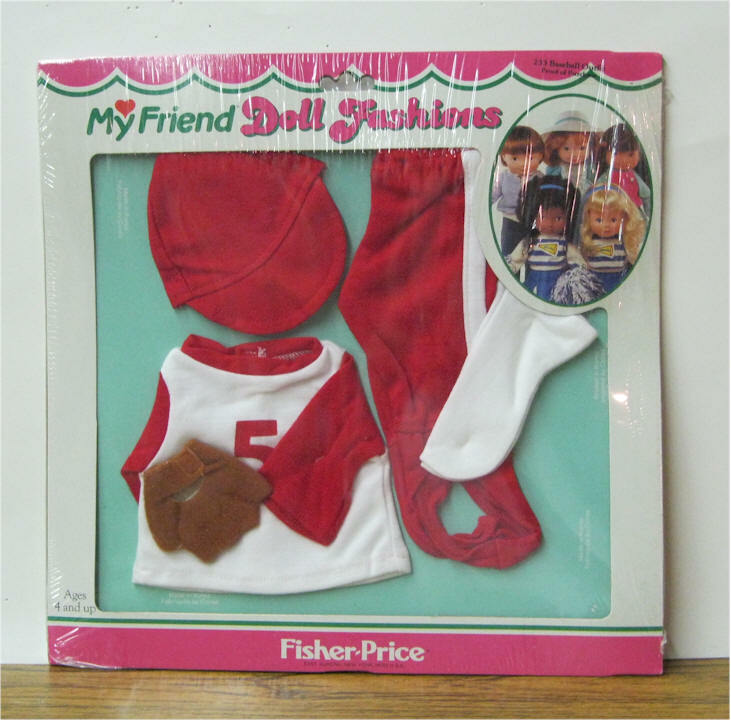 Comes with red clogs. #229 Knickers Outfit. 1980 - 1982 . 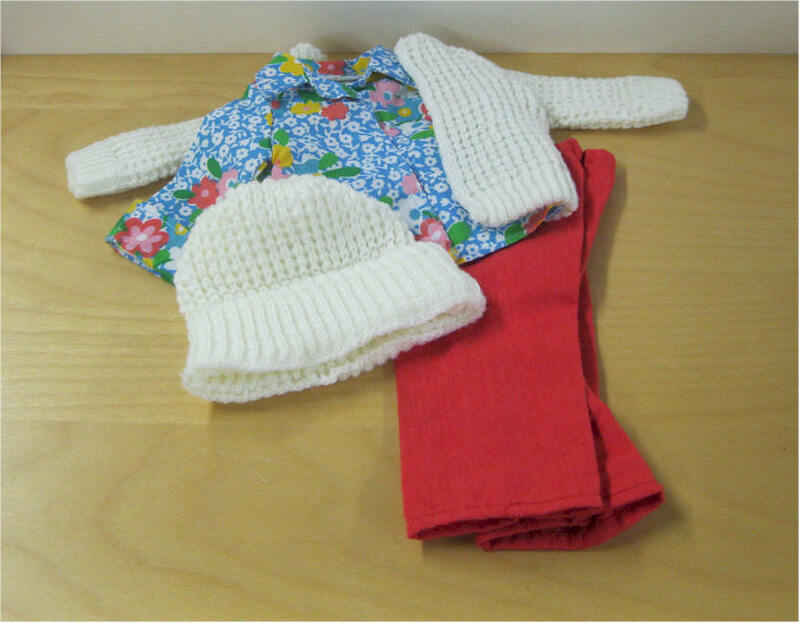 Knickers, beret, blouse and socks. 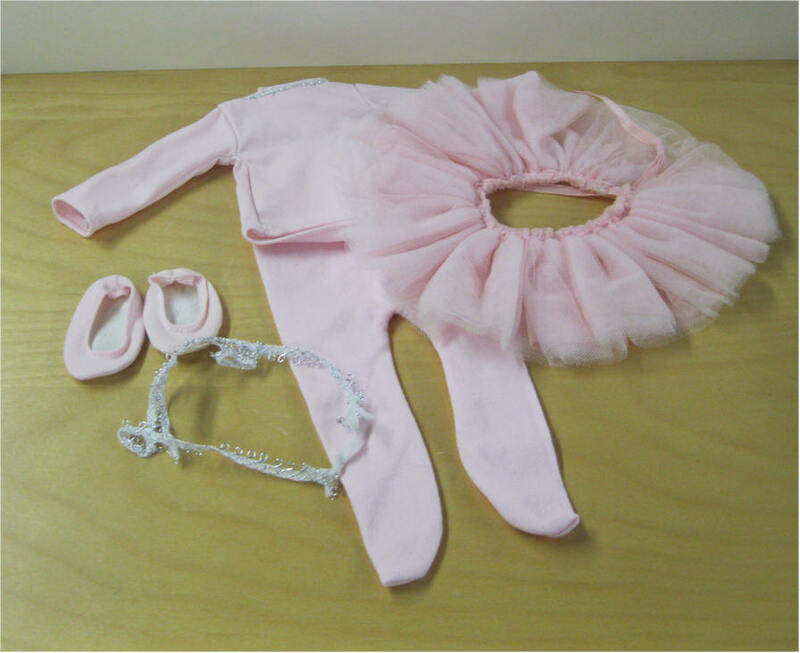 #228 Ballerina Outfit. 1980-1985. 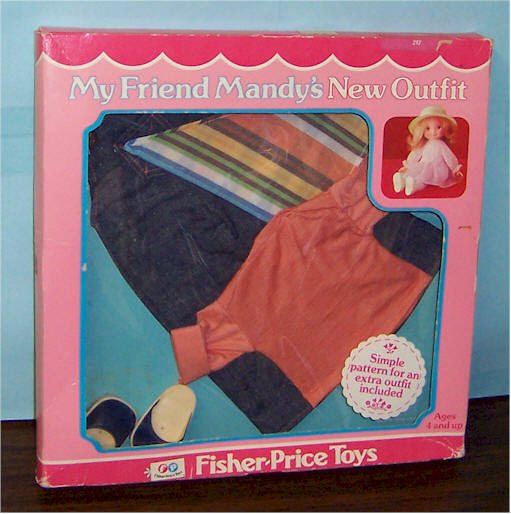 Pink body with matching tights, and slippers. 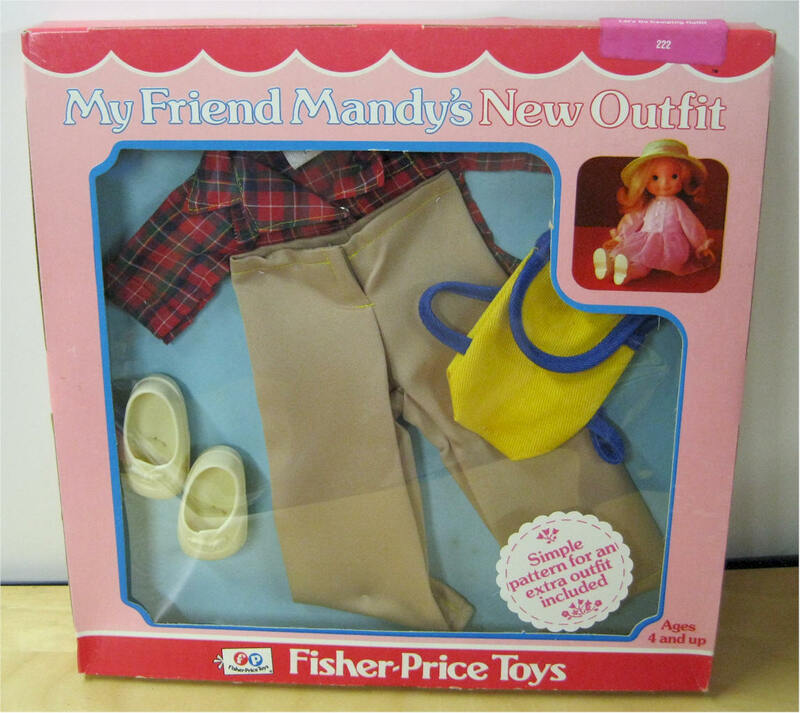 #218 Town & Country Pantsuit Outfit. 1977 - 1978. Pants with elastic waistband, three fasteners on matching shirt jacket w tie and fashionable white clogs. Very Clean. My Friend Becky's Dress. Clean. My Friend Jenny's Jumper. Clean. No holes or stains. 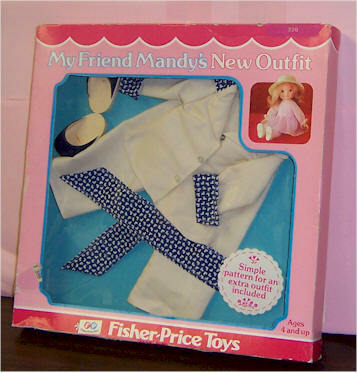 My Friend Mandy's Dress. Clean.